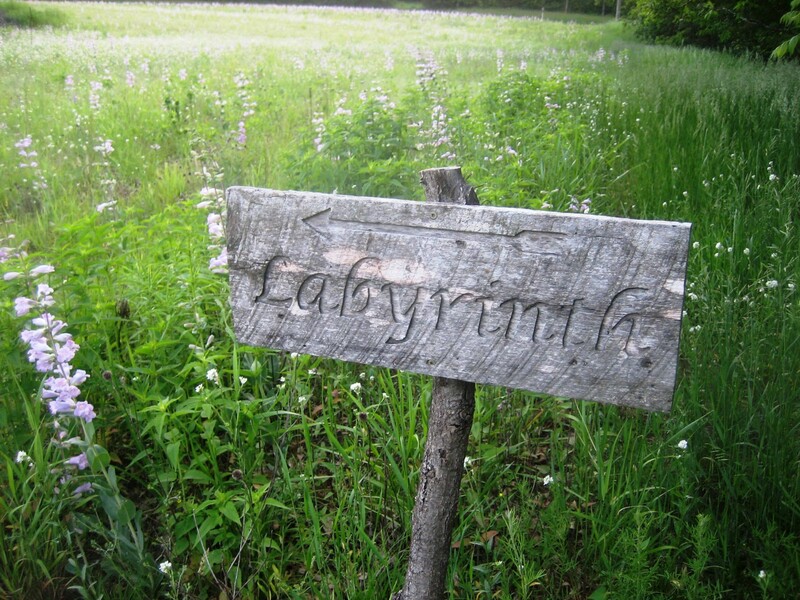 Our labyrinth is located on the south central portion of our land in the short grass prairie with trees to the north and east. Signs direct you on a path to it from the west side of the old (unpainted) sheep barn. At the top of the incline follow the mowed path to the right. Robert created our seven-circuit labyrinth which is mown prairie grass and flowers. In the winter we walk it with snow shoes as in the picture above. Known as a classical labyrinth, this is oldest known form which has been used since 2000 BCE. The labyrinth is not a maze. There is only one path into the center and that same path is then taken out again. In a maze you lose yourself, in a labyrinth you find yourself. The path winds throughout and becomes a mirror for where we are in our lives. Traditionally the labyrinth is walked in silence as it is a path of meditation. Walking in silence quiets the mind and honors others’ spiritual journey. It is a tool to guide healing, deepen self-knowledge/knowledge of one’s relationship to the Divine and empower creativity. It is found in all religious traditions in various forms around the world. Releasing ~ letting go of the details of your life. This is the act of shedding thoughts and distractions. It is a time to open the heart and quiet the mind. Returning ~ following the same path out of the center as you came in, you enter the third stage, which is joning God, your Higher Power, or the healing forces at work in the world. Each time you walk the labyrinth you become more empowered to find and do the work you feel your soul reaching for. Clear your mind and become aware of your breath. Allow yourself to find the pace your body wants to go. Try not to have pre‑conceived expectations about the walk. Allow the awareness to find you. There is no right way or wrong way to walk a labyrinth. 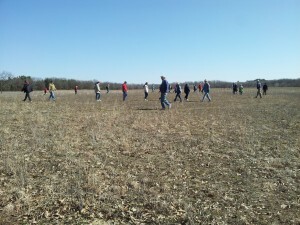 Whatever happens during the spiritual exercise of labyrinth walking can be used as a metaphor for our spiritual lives. The labyrinth is a two‑way street. When one person is going into the center, another person can be exiting from the center. They will meet somewhere on the winding path. When people meet on the path, as they meet in life, they may want to do whatever comes naturally to them. They may want to greet the person or if they are very inwardly focused, that person may choose to keep their eyes lowered and continue on their way. It is important to find and honor your own pace on the path, which will often change throughout the three stages of the walk. Follow the pace your body wants to go, not the pace the mind may think you should go. In order to honor your pace, give yourself permission to move around others during the labyrinth walk. Some people are drawn to a very slow pace. Others glide around the turns as if they had wings. Moving around one another is the key to discovering and staying with one’s own flow. The labyrinth offers a spiritual exercise that becomes the path of life. It allows the wandering soul to find a way to center, to find a way home.